Buben&Zorweg have been a luxury watch leader in the world market for watch winders of automatic watches for many years now. Buben&Zorweg has introduced its new TIME MOVER® HANDWOUND watch. The high-end manufacturer has reached another critical milestone for its innovative watch products. One fact was obvious to Buben&Zorweg. Extended periods of standstill of winding watch are as detrimental to the valuable calibres of precious handwound watches as they are to the inner workings of automatic watches. A critical issue that had to be overcome related to handwound watches was the lack of a safety clutch. It’s important to be able to increasingly apply force to the spring until it reaches its ideal tension, but not go too far and damage the watch. The solution from Buben&Zorweg was the ingenius The TIME MOVER® HANDWOUND watch. The device is equipped with state of-the-art, electronically controlled sensors that monitor changes in spring tension until it reaches the ideal point. The end result is that the winding process stops in just a matter of milliseconds, as soon as this tension point is reached. What this mean is that handwound watch lovers can now feel safe with a perfectly wound watch in their fingertips. The watch’s winding rollers that clamp the crown of the watch are a prime example of the technology Buben&Zorweg delivers. The luxury watch brand developed a very special rubber mixture that was developed just for the rollers. The TIME MOVER® technology thus provides an ideal solution that has long since prevailed by the collectors and lovers of luxurious automatic chronometers. 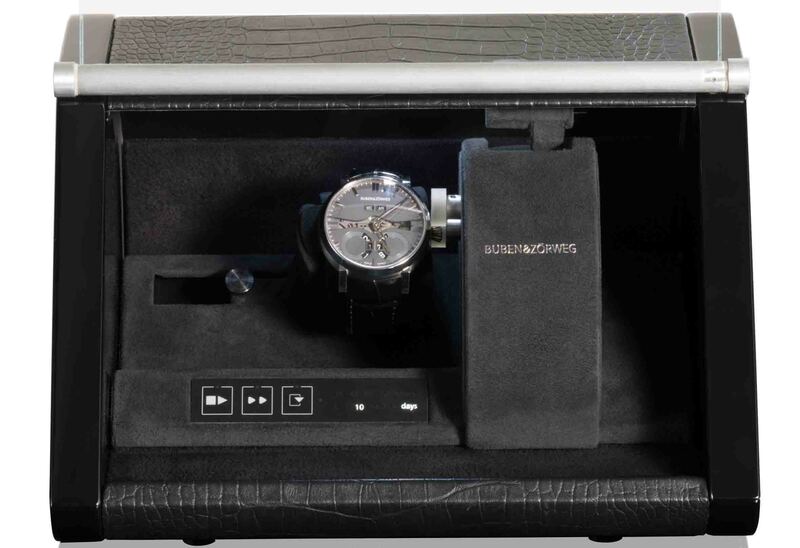 If you are interested in purchasing a new TIME MOVER® HANDWOUND watch model from Buben&Zorweg, then please contact The Life of Luxury and one of our product specialists can assist you with product pricing and procuring your watch.